Ryan Dufrene sent in this one. "Here is a picture from one of the most emotional times of the entire summer, finals night. 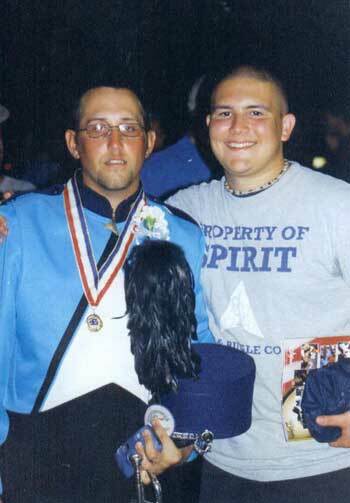 This is a picture of my longtime friend (and big brother in Phi Mu Alpha) Billy Geraci (age-out lead soprano for Spirit of JSU) and me on that very night in 2003 in Orlando. "Now, I never marched corps, but I'm a huge fan and I have many friends that have/do. I could see the emotion just pouring out of everybody that was there -- members, fans, instructors -- and I was involved too. I'm not scared to admit that I was crying right along with Billy (he's gonna kill me) and the others." Thanks Ryan! E-mail your Forzato submissions -- and we will get to them all, in time (and we're posting them in the order they were received) -- to dave@dci.org along with where and when the photo was taken. Send some biographical information about yourself as well. We'll give you full credit. Also, let us know if you want your e-mail address included.